Filipinos are one of the many nationality that really celebrate and welcome the new year in a festive (noisiest?) way. With fireworks, firecrackers, lights, sounds and food all over the place, it just really defines how Filipinos welcome the brand new year to come. For most of the time, foods are the center of the attraction and occasion. 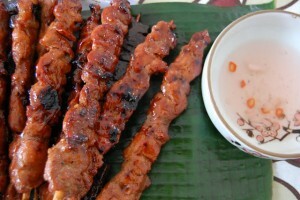 As we all know, each and every nation do have their very own traditional foods that are “must have” at the table during new year celebration. 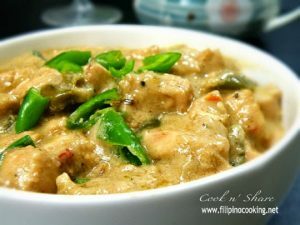 Below is a list of traditional Filipino foods linked to their recipes in case you wanted to try them out for your very own new year’s eve celebration. 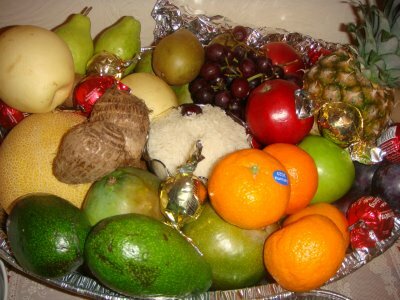 Filipinos prepare and displays 12 rounds fruits of different kinds at the table to signify 12 months of the year. 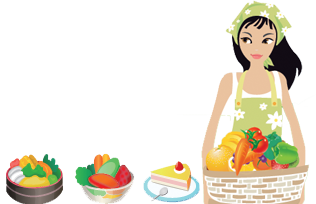 The fruits (sometimes including vegetables) may vary in size and a bit in shape because having 12 rounded ones can be a tough one to complete so some may end up having mangoes and bananas which are not circular in shape. And oh, some prepare 13 fruits instead of just 12 (if you know the reason, please state it at the comment section, thanks). 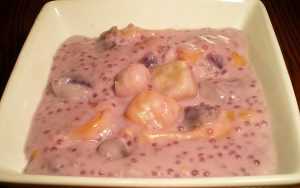 It can be fruit salad, vegetable salad, chicken macaroni salad or buko salad. The more colorful it is, the better because it signify a much more livelier and colorful life for the year to come. 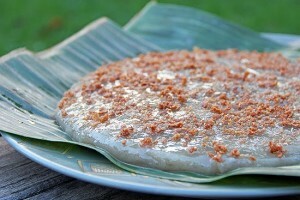 Biko, Maja Blanca, Calamay or anything that is made of glutinous or sticky rice is a must have too. It is said that it can bring or attract and make good luck to stick around for the people at home or anyone who will eat it when 12 midnight (new year) hits. Any kind of pancit (noodles) recipes will do. The favorites are pancit malabon, pancit bihon, pancit luglog and most of the time Filipino style spaghetti is also served. 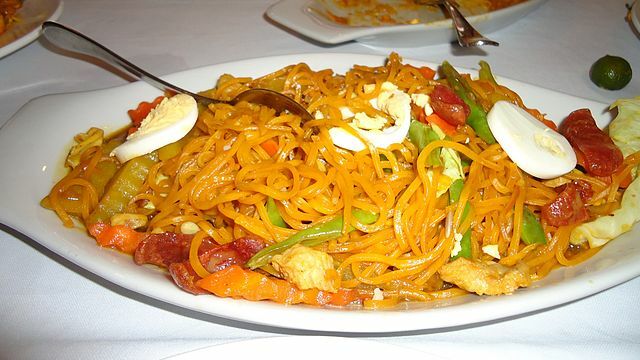 Pancit (noodles) signify longer life for every one. Not to mention the eggs that serves as toppings for noodles dish signifies new life. 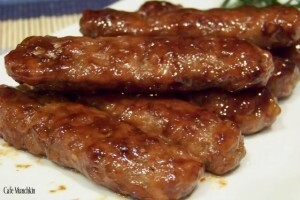 It can be grilled or fried. 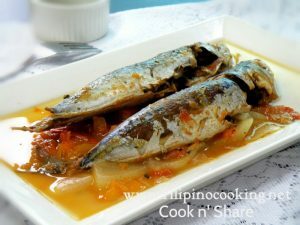 The favorites are sweet and sour, escabeche and most of the time, rellenong bangus. 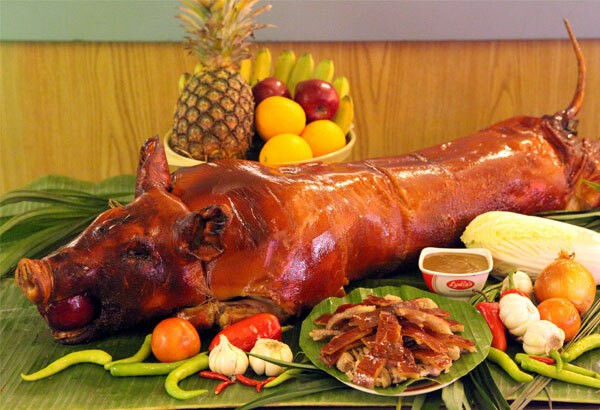 For Filipinos who have bigger budget for the occasion, they can offer a whole roasted pig for the family and relatives. 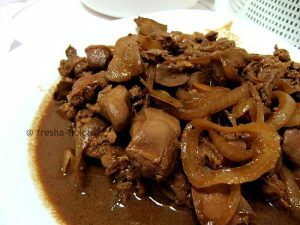 As far as I know, it doesn’t signify anything but this Filipino dish can be the everything for the new year’s eve celebration. Also, the leftovers can be cook at the following day as lechon paksiw so they don’t have to dish out money (a Filipino tradition) for food or to spend at the very first day of the new year. 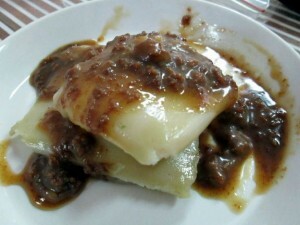 The above mentioned foods are just few of the many that I can mention. How about you? can you think of any food that is quite traditional in your family for the new year’s eve? I've heard so much about fruit traditions on the night the New Year's Eve. 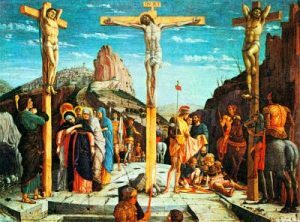 I miss those traditions especially since we're not doing it here in the Middle East. My family back home still do it though. Yum, yum, yum, now I'm hungry. 🙂 The lechon looks crunchy and tasty, I'm craving for it right now. Family when grocery shopping earlier and we have grilled fish already and we still have fruit salad in the fridge. 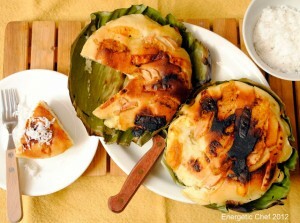 Fruits, local delicacies and lechon are definitely great food for the new year celebration. We won't have a lot of people around this year (my brother, cousins and nephew, our guests every single Christmas season) are in Vancouver for the holidays kaya we won't be preparing much. 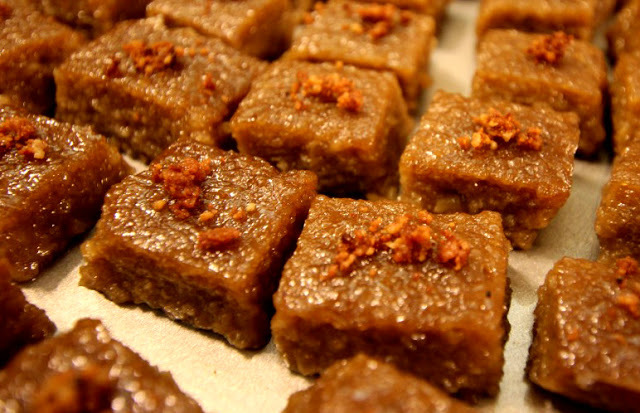 Ayyy I dont have the biko.Sayang, it's my fave pa naman!